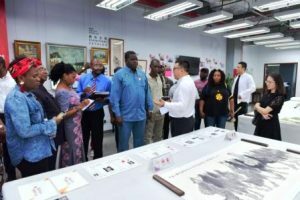 OTUNBA OLUSEGUN RUNSEWE DG (NCAC) LEADER OF THE DELEGATION AND OTHERS BEING GUIDED AROUND THE HISTORICAL FACTS OF THE ARTRON ART CENTRE IN SHENZHEN ONE OF THE FOREMOST EXHIBITION CENTRE IN CHINA DURING THE TRAINING WORKSHOP. The Director-General of the National Council for Arts and Culture, Otunba Olusegun Runsewe has described Nigeria as the heart and soul of African culture. Otunba who led a delegation of 22 delegates from 8 African countries to the Arts and Creative Design Training in Shenzhen, China, made this declaration while speaking at the opening ceremony of the programme. Runsewe said that Nigeria, the giant of Africa, is the most heterogeneous nation in the continent of Africa with very rich and diverse cultural heritage, making it the heart and soul of African culture. Noting that China and Nigeria have a long history of robust diplomatic relationship, he said that the Creative Design Training will further strengthen the already existing cordial relationship between China and Nigeria. While appreciating the Chinese government for the opportunity given to Africans to benefit from Chinese experience in the area of using the Arts, Culture and Design to drive the process of development, he called for greater partnership between China and Nigeria for the benefit of the two countries. Otunba who said that China and Nigeria have many things in common such as their rich and diverse cultural heritage as well their variety of fascinating artistic products, expressed Nigeria’s readiness to tap from the knowledge and expertise of China in developing Nigeria’s Arts and Culture sector. He commended the Shenzhen administration for developing the province from a mere fishing settlement of about 300,000 peasant farmers and fishermen in 1979 to a modernized international city with a population of 20 million people. Receiving the African delegation earlier, Ms. Yang, Deputy Director of Shenzhen Administration of Culture, Sports and Tourism, said that the training was aimed at strengthening the cooperation between Shenzhen and Africa in the areas of Culture and the Creative and Design Industry. The seven-day intensive training included lectures, group discussions and interactive sessions as well as visits to frontline Arts and Creative Design Industries in China. Eight African countries who participated in the training programme where Nigeria, Angola, Sierra Leone, South Africa, Sao Tome and Principe, Mozambique, Equitorial Guinea and Seychelles.